The refractive index (n) of a material is the ratio of the speed of light (c) in a vacuum to the velocity of light in the material (cS). The refractive index of a material is always greater than 1. 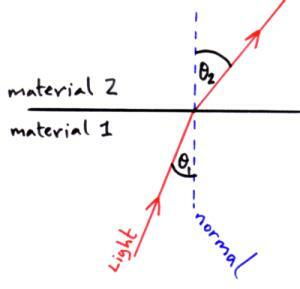 When a ray of light goes from material (1) into material (2), rather than from a vacuum into a material we talk about the relative refractive index. The relative refractive index can more or less than 1. 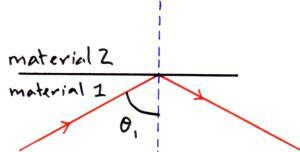 If we go from material 1 with refractive index (n1) into material 2 with refractive index (n2). Then we can find the relative refractive index 1n2 by dividing the speed of light in material 1 (c1) by the speed of light in material 2 (c2) OR by dividing the refractive index of material 2 (n2) by the refractive index of material 1 (n1) OR by dividing the sine of the incident angle (q1) by the sine of the refracted angle (q2). 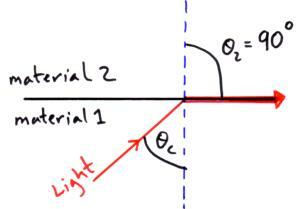 If the incident angle is greater than the critical angle then light reflects at the boundary between the two material and this is called Total Internal Reflection. This is has a fine glass core and it is surrounded by a cladding of glass with a lower refractive index than the core. This means that light shone into the core at an angle greater than the critical angle will Total Internally Reflect at the boundary between the core and the cladding. The light then travels down the fibre through a series of reflections before exiting at the other end. The optical fibre would work without the cladding as air also has a lower refractive index than the core glass. However the cladding is useful as it protects the core, prevents cross talk and prevents the leakage of light. 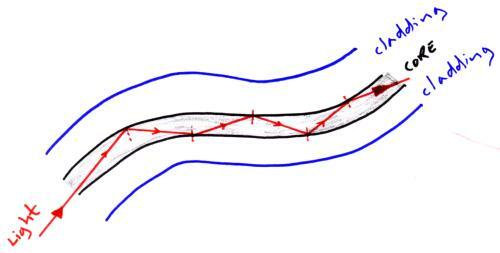 The core should be narrow as this cuts down on multi-mode dispersion which is where light entering the optical fibre at slightly different angles follow slightly different paths and arrive at the other end a slightly different times this causes the pulse of light to broaden out. Optical fibres are used in medical instruments called endoscopes and they are used in communications (telephone, Internet, cable TV). The use of optical fibres in communications has improved the transmission of data giving us high speed internet access.